Octava 4k Video over LAN/IP distribution system. - Video Over IP and HDMI Video Connectivity Solutions. Octava 4k Video over LAN/IP distribution system. Octava introduce new category of 4k Video over LAN/IP distribution system. The Octava PRO DSX is a simple to use, feature rich 4K HD video over LAN /IP distribution solution designed to deliver multiple 4k UHD video sources to multiple displays over standard CATx Ethernet cables. 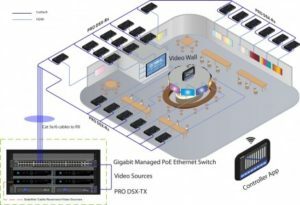 The PRO DSX delivers stunning high quality video from multiple sources to virtually any number of displays utilizing standard Ethernet cables and 1G Managed Ethernet. The PRO DSX series includes: PRO DSX –TX (encoder/transmitter) and the PRO DSX-RX (decoder /receiver) both PoE or locally powered. Supports 4k UHD and HDCP 2.2. The PRO DSX also delivers bi-directional IR, RS-232, and USB over the same CATx cable along with the audio and video thus allowing integrators to have total flexibility and ability to control connected devices. The Octava PRO DSX also functions as a Video Wall processor to create n x m (2×2, 3×3, 4×4 and etc.) large video screen walls. The Octava PRO DSX is available now.